A Russian state television broadcaster asserts that one of his country’s top targets for attack in the event of nuclear war would be a 4,700-acre site east of Arlington that encompasses a key transmission center for the Pacific submarine fleet and a forested recreational area for military personnel. In a Sunday evening broadcast, Dmitry Kiselyov featured a map of the United States that listed Jim Creek along with the Pentagon and the presidential retreat at Camp David as initial strike targets Russian would want to hit, according to a report from Reuters. Kiselyov is a high-profile journalist tapped by the Russian government to head a weekly news show called “Vesti Nedeli.” But Kiselyov’s credentials as a Kremlin insider appear to be diminished by his inclusion on the map aired Sunday of Fort Ritchie, a military training center in Maryland that closed in 1998, and McClellan Air Force Base in California, which was shuttered in 2001. Kiselyov claimed that hypersonic missiles Russia is developing could hit the U.S. targets within five minutes of launch. The Reuters news report described Kiselyov’s segment as “unusual even by the bellicose standards of Russian state TV.” Asked to comment Monday, a Kremlin spokesperson said it did not interfere with state TV editorial policy, according to Reuters. Kiselyov remarks come amid concerns about a renewed nuclear arms race. The Trump administration earlier this year announced the U.S. withdrawal from the Intermediate-range Nuclear Force Treaty, which could open the door to eventually deploying such missiles in Europe. Putin has said that could lead to Russia placing hypersonic missiles on Russian nuclear submarines that could strike U.S. targets. Jim Creek, the Washington state target spotlighted in Kiselyov’s Sunday broadcast, is a relatively obscure U.S. military site, located about 60 miles from Seattle. Jim Creek is currently under the command of Naval Station Everett, and a spokeswoman for the naval station declined to comment Monday on the Russian television broadcast. She referred a reporter to the Defense Department for comment. 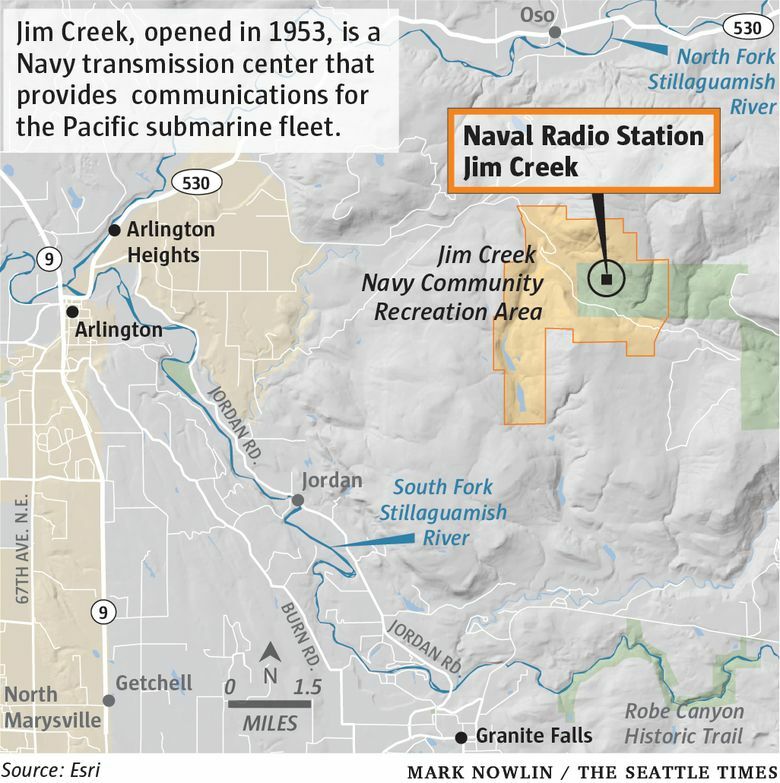 When the Navy opened Jim Creek back in 1953, it was hailed as the most powerful radio station in the world. Currently, it has a network of radio antennas that span 980 acres, and is “still among only a handful of radio stations capable of providing more than one million watts of power allowing the U.S. Navy to communicate with ships, submarines and aircraft anywhere around the world,” according to a 2017 Navy public affairs posting about the site. Jim Creek’s major focus is providing operational command, control and communication for the Pacific submarine fleet. That fleet includes the Trident submarines homeported at Naval Base Kitsap in Bangor, which is the site of a strategic nuclear weapons facility. The Jim Creek radio network is supported by six 200-foot-tall towers, and more than 360 miles of copper cable conductors form the antenna. All of this is maintained by federal civilian personnel, who keep the radio station operating 24 hours a day, according to the Navy public affairs posting. While access to the radio station is largely restricted, an adjacent recreational area open to military personnel and their families includes a campsite with recreational hookups, lakes stocked with trout, trails through old-growth forests and a fitness center.